Churches maintain many documents—some they must maintain permanently, others only briefly. Those responsible for their upkeep deserve accurate information regarding how to responsibly look after each document. With so much personal and organizational information in their care, record keeping is an opportunity to display stewardship and respect to church members. Before you can maintain them, you have to know what they are. There are legitimate reasons for your church to reveal its private documents. Set rules for retaining or discarding church documents. 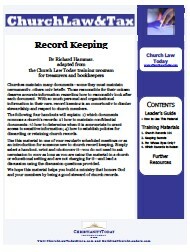 Books, downloads, and websites to help with your church’s record keeping.